There is a great deal of shade and very little screening in this town house garden. It lacked character and there was no real 'flow' to the garden. By introducing a waterfall onto a cedar screen, a connection was made between the tall beeches and the house. 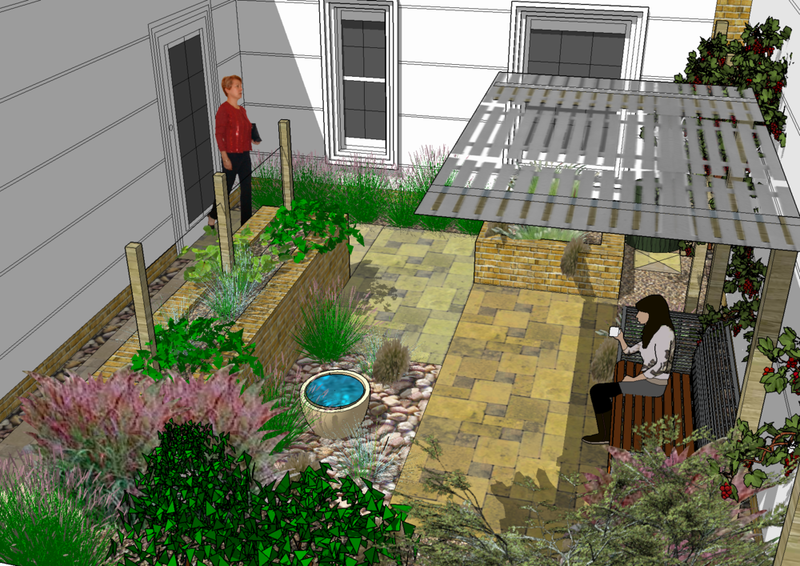 Plenty of space was created for relaxing and socialising by extending and raising the paving whilst new planting created screening. "I am really, really pleased with the result: you interpreted my ideas and wish list brilliantly" Mrs B. This small courtyard lacked life, warmth and colour! As almost every room in the house looked on to this small space, it was important that it should have all-year interest and be characterful. “Utterly brilliant! The whole house now glows with warmth - even when the skies are steely grey! 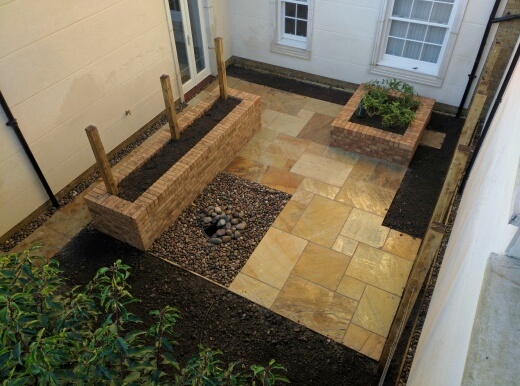 I can’t tell you what a difference it has made to living here.” Mr Mike C.
The retired owner wanted a courtyard where she could have some privacy and a space for reading and relaxation. By designing a wooden slat canopy and incorporating a terracotta water feature a more intimate space is made but without feeling cramped. Another work in progress. The owners want a garden that reflects their interest in yoga and incorporates a quiet zen-like space for reflection and relaxation. The bold shapes and colours aim to reflect the robes of a Buddhist monk and the pose of meditation. Having moved around in her professional life the client was keen to create a cottage garden. A false door was fixed to the brick wall, hurdles fitted as screening to the garage and separate zones created for sitting and relaxing in. this was complemented by relaxed, colourful planting. "There is no way I could have envisaged this; it's great. I will miss you all working here!" Ms O. This was a town house garden on a slope with poor planting and deteriorating walls. The clients wanted a more open area for entertainment, a pond for wildlife and all-year plant interest. As we were building the patio we found an Edwardian ice-well: we incorporated that into the design by giving it a glass cover with under lighting for dramatic nighttime effect. 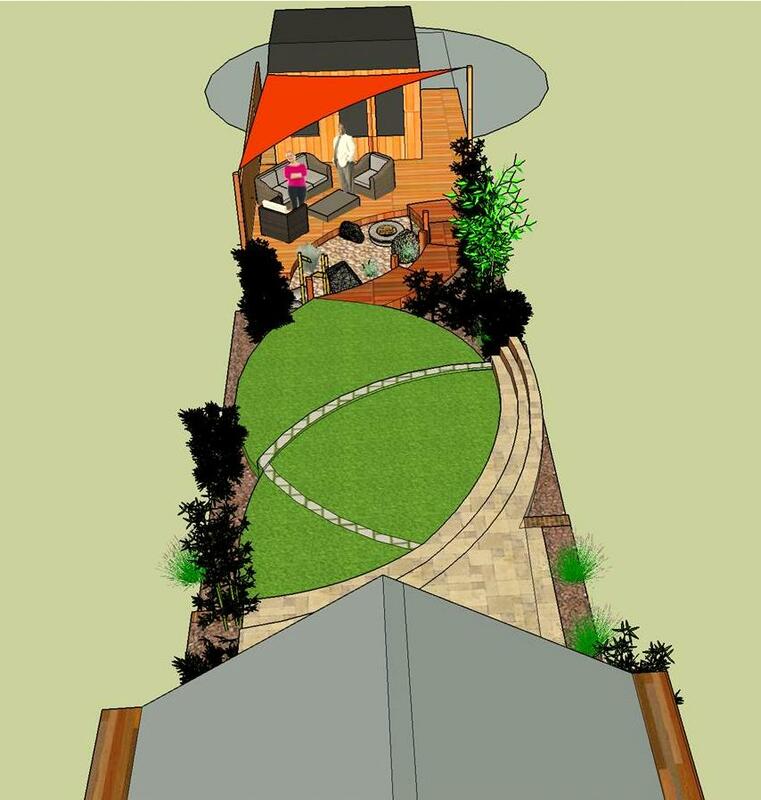 "We were very, very impressed by Will's imaginative design and attention to detail. We couldn't be more pleased by the work." Mr & Mrs W.
A garden owned by a retired couple who wanted to relax outside and to make gardening easier. By constructing raised timber beds and fitting a pot with over-flowing water the garden was ready for them to put in their plants as they wished. "We are delighted by the results and the way the work was undertaken. Very happy indeed." Mr & Mrs P.